Husband and I have made it our mission to avoid the interstate at all cost. Despite feeling like you are being shot out of a dangerous, crowded canon for hours on end, you can’t even see anything outside the window except for a green blur with the occasional neon blip. However, just on the other side of that green blur, within your very grasp, are towns, landmarks, shops, greasy spoons, cemeteries, farms, oddities, and history, which are sometimes all one in the same. All you have to do is exit. The next time you decide to head south to the Gulf Coast, take Hwy. 31. Did you know that Chilton County peaches don’t come from a glorified truck stop jammed with RVs and chachka? They come from orchards scattered along the sides of the roads and sometimes from the tailgate of a farmer’s truck. Take a side trip through Verbena. It is a beautiful little town with a big, white church, and old train station, and clapboard houses. It looks like a postcard, and you aren’t even near the sea. 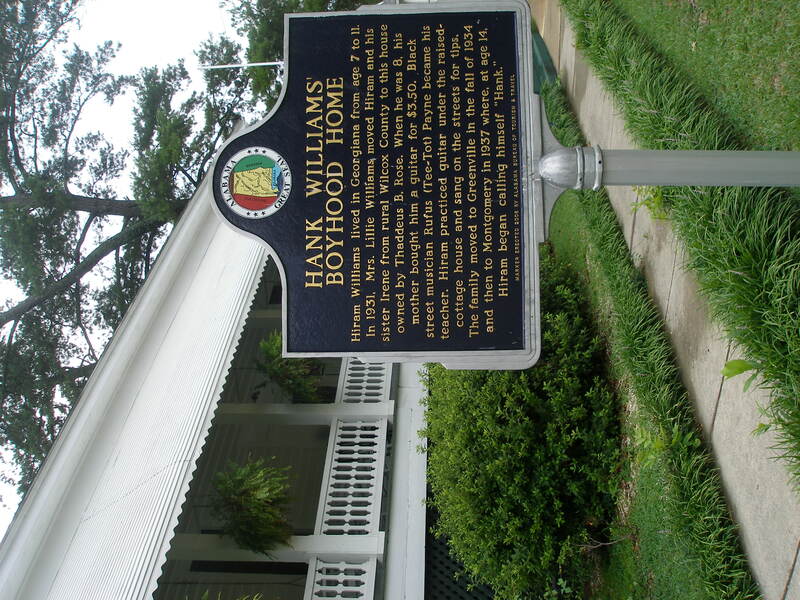 A little further down the road, stop off in Georgiana to see the childhood home of Hank, Sr.
Piddle on down through Milton, FL. If you simply must eat lunch somewhere that provides a porch and a rocker, I highly recommend the Blackwater Bistro in downtown. Their chairs face the Blackwater River, not an asphalt parking lot, not to mention the business is locally owned and the food is home-cooked. Take Hwy. 5 to Hwy. 43 down toward Mobile. Go see Gee’s Bend where the quilts are actually made. Pictures can never adequately portray how isolated and impoverished Wilcox County is. You will gain a whole new appreciation for the hands who pieced those scraps together to make something useful and beautiful. And don’t bypass Grove Hill just because the “new highway” does. You might miss out on the steam table at Glenda’s serving up fried chicken, greens, cornbread, and tea sweeter than a mother’s love. Forget about Atlanta being the hub to everywhere. If you want to go to North Georgia, head up through Rome and stop to see Myrtle Hill Cemetery, which is the final resting place for Confederate soldiers and a president’s wife, among others. Drive all the way to the top of the hill and look out over downtown where the Etowah and Oostanaula Rivers converge. Next stop off in Dahlonega at Quigley’s Rare Books and Antiques, right on the town square, and be amazed at their collection of first editions and out-of-print works. If you can manage to leave Quigley’s, head right on over to Clarkesville and find your way to Mark of the Potter, which is way off the beaten path and totally worth very extra mile. Housed in an old grist mill situated on the banks of the Soque River, Mark of the Potter showcases the work of local artisans and has since the 60s when the mill’s machinery was destroyed in a flood. While you shop, the kids can feed the trout from the deck or play along the banks, but there’s no fishing allowed! These are but a few examples of the marvelous treasures you can find if you just get off the path that has been beaten to a greasy pulp and onto the true roads less traveled. But you also can’t overlook the boarded up storefronts, the vacant lots, the overgrown railroad tracks, and abandoned houses peeking out from their blankets of kudzu. You must imagine the once vibrant hubs of commerce, travel, worship, and fellowship that now lie decrepit and abandoned. Conjure the ghosts of Main Streets past that finally surrendered to the highways and bypasses, to the big-box retailers and fast food restaurants, to the truck stops and strip malls. Catch a teeny glimpse what life was like before the four-lane frenzy made us all catatonic travelers, hurtling down the road to the next exit blind to all that we pass and all that passes us. The next time you travel, no matter how near or far, don’t just stare vacantly through your windshield at the bumper of the car in front of you. Open your eyes and take a look at the world around you, really see what there is to see, and enjoy the trip for more than just a harried means to a manic end. Don’t be like Kaw-liga…see what you’ve been missing. Posted in Uncategorized and tagged Blackwater Bistro, Blackwater River, Chilton County, Clarkesville, Dahlonega, Gee's Bend, Georgiana, Grove Hill, Gulf Coast, Hank Sr., highway, Kaw-liga, Mark of the Potter, Milton, Myrtle Hill, peaches, quilts, Rome, travel, Verbena, Wilcox County. Bookmark the permalink. I found it on 14 position, you have to build some quality backlinks , it will help you to increase traffic.